Law Web: When contention of doctor that he was called only for medical opinion can not be relied on? When contention of doctor that he was called only for medical opinion can not be relied on? Defendant No. 1 claims that he was only called, but once, by Defendant No. 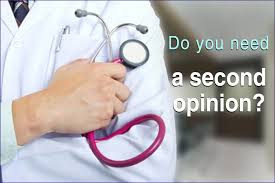 2 to give a second opinion for a patient of Defendant No. 2, the original Plaintiff No. 2. Consequently, he attended upon her only on 17th December 1987. He, therefore, claims that the case papers of the earlier dates do not bear any reference to him. The decision to take his opinion was recorded on 11th December 1987 and he attended on 17th December 1987. The endorsement in the case papers Exhibit-H of 17th December 1987 in the handwriting of Defendant No. 2 shows "seen the case and advised exploration". Another endorsement of the same date in the same handwriting shows "patient is for exploration next week". Defendant No. 1 claims that he was only called for his opinion. He gave his opinion advising exploration. He was the senior most honorary Surgeon of Oncology unit at that time. He is not shown to have been paid his fees for his opinion at all in the original bill for the charges of Plaintiff No. 1 for the hospitalization as also the surgery marked Exhibit-N in evidence. It would be inconceivable for Defendant No. 1 not to charge for his opinion, if he had given one. If he was only called for an opinion he would charge only for the opinion. In that case the surgery which he claims was required to be performed by Defendant No. 2 would show charges incurred for the surgery done by Defendant No. 2 as per the schedule of fees of BH. The original bill Exhibit-N instead shows the charges for surgery specifically in the name of Defendant No. 1 at the rate then applicable and charged by Defendant No. 1 and allowed to by BH; it does not show any charge for any opinion of any Consultant Surgeon. It must be appreciated that the charge for opinion, if any, to perform exploration would be included in the surgery charge itself if surgery was to be performed. 49. The schedule of fees fixed by BH at the relevant time for senior honorary Surgeons was Rs. 5000/-. The assistant Surgeon was entitled to charge 1/3rd of that fee. Pertinently the charge of Defendant No. 2 for the surgery specifically against the name of Defendant No. 2 is Rs. 1667/- which is a 1/3rd of a fees of the honorary Doctor, Defendant No. 1. Similarly the schedule of fees showing charges of the Anesthetist is 1/3rd of combined fees of honorary Doctor and the assistant Surgeon. The fees of Dr. R. Kotak, the Anesthetist against her name is shown to be Rs. 2222/- precisely 3rd of Rs. 5000/- plus Rs. 1667/- being 1/3rd of Rs. 6667/- i.e. Rs. 2222/-. This is the largest single circumstantial evidence of the fact of Defendant No. 1 was the honorary Surgeon for the surgery of the original Plaintiff No. 2 as contained in the original bill of BH marked Exhibit-N in evidence. His fees of the surgery coupled with the total absence of his fees for his opinion makes it conclusively clear that he was the honorary Surgeon for the original Plaintiff No. 2. The original Plaintiff No. 2 was admitted under him. The contract between the two parties - Defendant No. 1 being the honorary Doctor of the original Plaintiff No. 2 is, therefore, made out. Padam Chandra Singhi and Ors. Dr. P.B. Desai and Ors.